Published: Nov. 30, 2010 at 10:00 a.m. Updated: Aug. 23, 2012 at 04:17 p.m. The following information regarding player safety is included in the 2010 League Policies for Players manual, which is distributed to all players and coaches at the start of training camp. It includes detailed information on illegal hits, including diagrams. We hope this information is helpful in understanding the NFL's player safety-related rules. There has been no change in rules since the start of the season, only an increase in the level of discipline for violations of existing rules. The process for a play to be reviewed for potential disciplinary action starts with the NFL Officiating Department reviewing every play of every game. Any play involving a violation that needs to be reviewed for possible discipline, whether flagged on the field or not, is referred to Executive Vice President of Football Operations Ray Anderson and his staff, which includes Director of Football Operations Merton Hanks, a nine-year NFL veteran (1991-99). Merton Hanks or Ray Anderson makes the initial determination for discipline for on-field violations. The player has the right to appeal league discipline. The Collective Bargaining Agreement specifies that appeals of fines or suspensions of players for unnecessary roughness or unsportsmanlike conduct are determined by the Commissioner's designee. The decision on persons appointed as the Commissioner's designee for on-field player discipline appeals is made in consultation with the NFL Players Association. Appeals are heard and decided by Pro Football Hall of Fame player and former NFL coach Art Shell and by former NFL coach Ted Cottrell. Shell and Cottrell are appointed and paid jointly by the NFL and NFLPA. All on-field fine money collected by the NFL is used for charitable purposes. These funds have been used to support retired player programs, including the NFL Player Care Foundation and NFLPA Players Assistance Trust; disaster relief initiatives; and other charities supporting youth, education and sports-related medical research. All of the player safety and on-field conduct rules that follow can be summarized in one word-"sportsmanship." Sportsmanship is a cornerstone of the game of football and of vital concern to everyone involved in the game, including players, coaches, officials, and League personnel. The term sportsmanship conveys respect for the game, respect for opponents, respect for the game officials, and respect for the fans. The League will not tolerate unsportsmanlike conduct. This applies to any act which is contrary to the generally understood principles of sportsmanship. Unsportsmanlike conduct, discussed previously in this section and detailed in Rule 12, Section 3 of the Official Playing Rules of the National Football League ("NFL Rule Book"), is a foul under NFL rules and will be called by game officials (15 yard penalty). In addition, the player may be fined. Officials will immediately call a foul if any unsportsmanlike conduct occurs anywhere on the field. It is important to note that the unsportsmanlike conduct rules apply to all personnel in the team area, including players, coaches, team employees, and officials. Lack of respect or other unsportsmanlike conduct will not be tolerated during games or at other times, including postgame interviews. This includes abusive, threatening, insulting, or profane language or gestures, and physical acts by coaches, players, and other club personnel directed at opponents, officials, game personnel, or fans. Coaches and players should keep in mind that every NFL game is broadcast on radio and television, and that there are open microphones near the playing field as well as closeup camera shots that permit easy lip-reading by viewers. The League and its participants are severely criticized whenever obscene or profane language or obscene gestures are carried or shown on the air. Serious incidents of this kind will warrant disciplinary action by the League. Game-related safety presents special challenges to the League, because it requires dealing with the playing rules in a manner that not only offers optimum player protection and prohibits gratuitous violence, but also maintains the intense action and physical contact which are part of football's broad appeal. It also requires recognition that NFL players are uniquely talented, trained, and conditioned, with year-round preparation now the norm. Player safety is a top priority for the League in ensuring that the game is played as fairly as possible without significant unnecessary risk to its participants. It should also be a top priority for all NFL players. Remember, many of the player safety rules are designed to protect not only the player who gets hit, but also the player who does the hitting. Illegal acts that jeopardize the safety of players will not be tolerated. The League will continue to stress enforcement of the personal foul rules, with special emphasis on the unnecessary roughness and roughing the passer rules that prohibit hits on players in defenseless positions, including passers in the act of passing, receivers in the process of attempting to catch a pass, a runner whose forward progress has been stopped and is already in the grasp of a tackler, a kickoff or punt returner attempting to field a kick, and a player on the ground at the end of a play. You should pay special attention to the rule concerning low hits on the quarterback where the defensive player had an opportunity to avoid forcible contact. These hits are illegal and will result in both onfield penalties and discipline by the league. Officials will continue to be instructed that, if there is any doubt as to the potential for a foul, they should lean toward player safety and call the foul. To help NFL players understand their responsibility regarding player safety, this section contains clarifications and illustrations highlighting several of the League's unnecessary roughness and roughing the passer rules that are in effect. This is not a complete list of the rules. You are strongly advised to familiarize yourself with the more detailed and comprehensive descriptions contained in the NFL Rule Book and in particular the acts constituting unnecessary roughness and roughing the passer, detailed in Rule 12, Section 2, Articles 8 and 13. Rule 12, Section 2 also contains other important player safety rules that are not specifically illustrated or clarified in this section. Included in Rule 12, Section 2 of the NFL Rule Book, and also of vital player safety importance, are the illegal chop block rules (Rule 12, Section 2, Article 16). In addition, it is not legal to clip in close line play, unless the block from behind is above the knees. Also if a blocker in close line play rolls up from behind on the back of a defender's legs, it is a foul for unnecessary roughness (Rule 12, Section 2, Article 9). For this reason, it is vitally important that you become familiar with all the Player Conduct rules found in Rule 12 of the NFL Rule Book. The League recognizes that safety cannot be promoted exclusively through interpretation of existing rules or adoption of new legislation, and that the participants on the field must assume responsibility for making it work. Accordingly, to give further force and effect to player safety rules, the League will impose fines and/or other discipline for rule violations. Discipline may be imposed for a first offense and without any prior warning. A player who is a repeat offender should expect more severe discipline, and fines for third offenses and beyond in the same season or based on prior seasons' violations will be established by the Commissioner or his designee on a case-by-case basis, and may increase substantially. In addition, suspension without pay may be imposed when deemed appropriate. Discipline is not based solely on situations where game officials call fouls. In some cases a violation may be detected in postgame review of video. If a postgame review establishes an egregious violation, particularly involving safety-related issues such as hits on the quarterback, the offender may be subject to suspension. Defenseless players are defined as (a) a player in the act of or just after throwing a pass; (b) a receiver catching or attempting to catch a pass; (c) a runner already in the grasp of a tackler and whose forward progress has been stopped; (d) a kickoff or punt returner attempting to field a kick in the air; and (e) a player on the ground at the end of a play. 1. Use of Helmet and Facemask. An opponent must not use his facemask or other part of his helmet against a player who is in a virtually defenseless posture-for example, (a) by forcibly hitting the defenseless player's head, neck, or face with the helmet or facemask, regardless of whether the defensive player also uses his arms to tackle the defenseless player by encircling or grasping him, or (b) by lowering the head and violently or unnecessarily making forcible contact with the "hairline" or forehead part of the helmet against any part of the defenseless player's body. These provisions do not prohibit incidental contact by the mask or non-crown parts of the helmet in the course of a conventional tackle on an opponent. 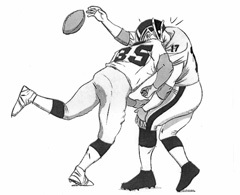 Special protection against blows delivered to the head by an opponent is also provided to a receiver who has just completed a catch, a kicker/punter during the kick or during the return, and to the recipient of a "blindside" block. 1. Receiver Who Has Completed a Catch. 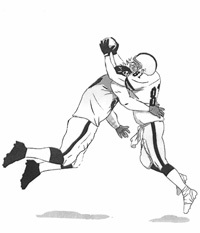 If a receiver has completed a catch and has not had time to protect himself, a defensive player is prohibited from launching (springing forward and upward) into him in a way that causes the defensive player's helmet, facemask, shoulder, or forearm to forcibly strike the receiver's head, neck, or face-even if the initial contact of the defender's helmet, facemask, shoulder, or forearm is lower than the receiver's neck. 2. Kicker/Punter During Kick or Return. During a kick or during a return, it is a foul if the initial force of the contact by a defender's helmet (including facemask), forearm, or shoulder is to the head or neck area of a kicker/punter. 3. "Blindside" Block. It is an illegal "blindside" block if the initial force of the contact by a blocker's helmet (including facemask), forearm, or shoulder is to the head or neck area of an opponent when the blocker is moving toward his own endline and approaches his opponent from behind or from the side. Because the act of passing often puts the quarterback in a position where he is particularly vulnerable, special rules against roughing the passer apply. 1. 1-Step Rule. Pass rushers are responsible for being aware of the position of the ball in passing situations. If a pass rusher clearly should have known that the ball had already left the passer's hand before contact was made, unnecessary roughness will be called. The Referee will use the release of the ball from the passer's hand as his guideline that the passer is now fully protected. Once a pass has been released by a passer, a rushing defender may make direct contact with the passer only up through the rusher's first step after such release (prior to second step hitting the ground); thereafter the rusher must be making an attempt to avoid contact and must not continue to "drive through" or otherwise forcibly contact the passer. Incidental or inadvertent contact by a player who is easing up or being blocked into the passer will not be considered significant. 2. Stuffing the Passer. A rushing defender is prohibited from committing such intimidating and punishing acts as "stuffing" a passer into the ground or unnecessarily wrestling or driving him down after the passer has thrown the ball, even if the rusher makes his initial contact with the passer within the one-step limitation provided for above. When tackling a passer who is in a virtually defenseless posture (e.g., during or just after throwing a pass), a defensive player must not unnecessarily or violently throw him down and land on top of him with all or most of the defender's weight. Instead, the defensive player must strive to wrap up or cradle the passer with the defensive player's arms. 3. Hitting a Passer's Knees. A rushing defender is prohibited from forcibly hitting in the knee area or below a passer who has one or both feet on the ground, even if the initial contact is above the knee. It is not a foul if the defender is blocked (or fouled) into the passer and has no opportunity to avoid him. Note 1: A defender cannot initiate a roll or lunge and forcibly hit the passer in the knee area or below, even if he is being contacted by another player. Note 2: It is not a foul if the defender swipes, wraps, or grabs a passer in the knee area or below in an attempt to tackle him. 4. Protection While Out of Pocket. When the passer goes outside the pocket area and either continues moving with the ball (without attempting to advance the ball as a runner) or throws while on the run, he loses the protection of the one-step rule and the provision regarding low hits, but he remains covered by all other special protections afforded to a passer in the pocket. If a passer outside the pocket stops behind the line and clearly establishes a passing posture, he is covered by all of the special protections. 5. Change of Possession. 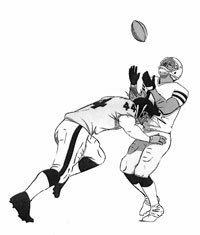 At any time after a change of possession, if the initial force of the contact by a defender's helmet (including facemask), forearm, or shoulder is to the head or neck area of the quarterback, it is a foul. The Competition Committee emphasizes that whenever a game official is confronted with a potential unnecessary-roughness situation and is in doubt about calling a foul, he should lean toward safety and not hesitate to throw the flag.